The prospect of escaping the snow, wind and general grayness of winter and going on a warm, Royal Caribbean cruise often sounds like the perfect plan. Of course, going on a Caribbean cruise in winter means what you will need to think about packing will be different than cruises throughout the rest of the year. Going on a winter cruise can see quite a swing in temperatures and conditions. This post will cover a few things you should take on any winter Royal Caribbean cruise, plus some additional items to consider when the weather is expected to be unseasonably cold. From the moment you leave your home to stepping foot inside inside the cruise terminal, there are a lot of weather variables to consider along the way. While a summer cruise simplifies packing since it is likely warm everywhere, you can see quite a different in temperatures before stepping foot onboard. Depending on where you live, winter can mean packing quite differently for the very beginning and very end of your trip. Keep in mind that even if it is not that cold on the day you leave, coming back a week or so later could result in vastly different temperatures. Bringing jackets and sweaters makes sense, although it comes at the expense of taking up extra room in your suitcase. Nonetheless, this may be an unavoidable issue, unless you opt to leave all the cold weather clothing in your car at the airport and hope for the best once out of the elements. Of course, the weather in departure ports in Florida or Texas can vary considerably. Some days will be in the upper 70s or even low 80s, but other days can see temperatures drop into the 60s or even lower. Generally speaking, packing in layers is the key. Cold fronts in these parts of the country are short-lived, and will not last long. Still, you do not want to be that family purchasing coats and sweaters at the first store you see for full retail price. If your cruise is out of New Jersey or Baltimore, then it is much more likely that it will be cold for the first day of your cruise and even another day or two. Packing a light jacket, like this Columbia Down Jacket, can be perfect because it compresses really well and takes up barely any suitcase room. It is smaller and warmer than fleece, and although a bit pricey, these last a long time and are perfect for cold weather. 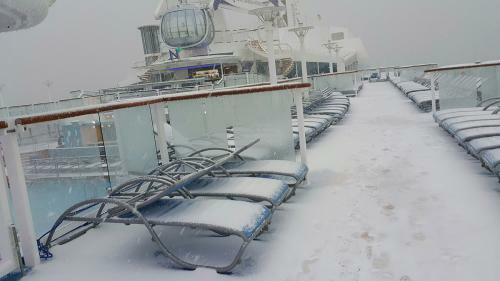 The issue with most winter cruises is what the weather is like on the first and last day of the cruise. Depending on where your cruise sails from, there is the possibility of it being chilly, or even plain cold. Anthem of the Seas sailings from Cape Liberty have even been known to have snow in the forecast. For cruises that leave from ports in the north, it is best to pack different layers. Onboard the ship, it will be plenty warm inside. The pool deck and other outdoor areas will be cold, but activities will be limited to indoors until the weather improves. The good news is the weather in the tropics tends to be very steady throughout the year. While cold fronts can move through, generally speaking, once your Royal Caribbean ship gets to the various ports on your itinerary, things will warm up quickly. This means you can pack shorts, t-shirts and flip flops, and forget about the weather at home. The Bahamas tends to be a bit cooler than the rest of the Caribbean, with warmer temperatures the further south you go. To give you an idea of what to expect, here are the average high temperatures for popular Caribbean ports in the winter. As you can see, the temperature warms up nicely as you get into the Caribbean. Packing layers is probably the best strategy for avoiding costly last-minute purchases and/or suffering through cold spells. Here are some general tips for anyone taking a Royal Caribbean cruise in the winter to keep in mind, especially when considering what to pack. Cruises coming from the north will likely see colder temperatures until the ship passes the Carolinas, at which point day time temperatures will start to rise. It is generally warm enough to swim during most winter months. Water temperatures take longer to change than air temperatures, so the warm summer months will keep it warm enough to enjoy for the most part during winter. Windbreakers are the perfect type of jacket if it is not quite warm enough yet to break out the shorts. Try one of these jackets for men and women. Anthem of the Seas (and other Quantum class ships) were designed for cold weather, and feature an indoor pool in addition to the enclosed Solarium. Winter is the dry season in the tropics, so while it may not be 90 degrees, the chance of rain during winter drops dramatically, as does the humidity. This means great weather for shore excursions. What you recommend packing for a winter Royal Caribbean cruise? Share some of your favorites in the comments. If you have any questions, let us know in the comments below and we will try to help!